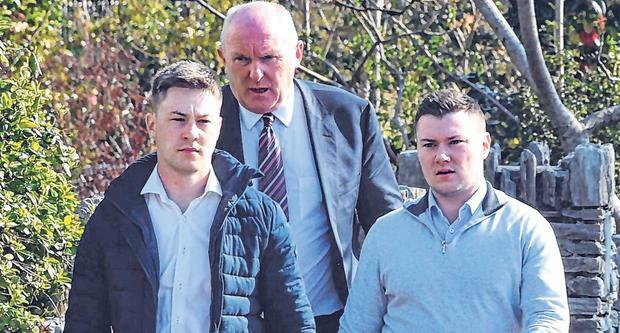 Padraig O'Connell was speaking after Jackie Healy Rae Jnr (23), Kevin Healy-Rae (22) and Malachy Scannell (34) were remanded by Kenmare District Court. Mr O'Connell said questions needed to be answered about media leaks. "Somebody in Dublin clearly requires to comment on that - I am making it quite clear this does not come from the local gardaí. Quite clear." The charges against the three defendants were heard for the first time before Judge David Waters at Kenmare District Court yesterday. The charges - which include counts of assault causing harm - all arise from alleged incidents in the south Kerry town almost 17 months ago. Jackie and Kevin Healy-Rae are grandsons of Jackie Snr, the late Independent TD for Kerry South whose election in 1997 began the Healy-Rae political dynasty. The young men's uncle, Danny Healy-Rae, is also an Independent TD for Kerry. Judge Waters was told the DPP had consented to all matters involved being dealt with on a summary basis before the district court. Having studied a medical report, Judge Waters agreed the matter could stay before the district court rather than be referred to Kerry Circuit Criminal Court. No details of the alleged assaults were given in court. He also asked for details on a criminal damage charge against Mr Scannell. Judge Waters was told it involved alleged damage to a pair of glasses that were "knocked off following an altercation". Having accepted jurisdiction, he granted an application by defence solicitor, Mr O'Connell, for disclosure orders in respect of all State evidence including witness statements. Mr O'Connell indicated, on behalf of the defendants, that all charges will be "vigorously and fully defended". Judge Waters adjourned until the June 7 sitting of Kenmare District Court when a date for the hearing will be set. None of the three defendants addressed the court beyond confirming their identities. Jackie Healy-Rae Jnr is an aspiring politician and deeply involved in election campaigns for his father and uncle. He is a candidate in the Kerry County Council election on May 24. His brother, Kevin Healy-Rae, operates a successful disc jockey business in Kerry. Both have an address at Sandymount in Kilgarvan, Co Kerry. Mr Scannell has an address at Inchinacoosh, Kilgarvan.